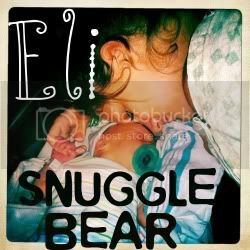 Snuggle Bear Eli: oh hey there. A lot of pictures. Of my big boyyyy. :) Who is almost crawling! Sorry i've been so... lazy. I sure have been enjoying nap time with Eli. cute pictures! i used to nap almost every time henry would when he was eli's age. that cake looks awesome and i love the picture of eli driving the boat!